Essential Phone Price, Review, Deals, Cost, & Sales! Home / Compare Cell Phones / Essential Phone Price, Review, Deals, Cost, & Sales! The Essential Phone is the brainchild of Android OS co-founder, Andy Rubin, who made a bold step in spearheading the design and unique features of his new and gorgeous creation. This device is equipped with a 5.71" LTPS IPS almost bezel-less display screen with 16 M colors and 1312 x 2560 pixels. The panel is protected by a Corning Gorilla Glass 5. While the Samsung S8 has the 5.8" Super AMOLED 16 M color screen with 1140 x 2960 pixels. 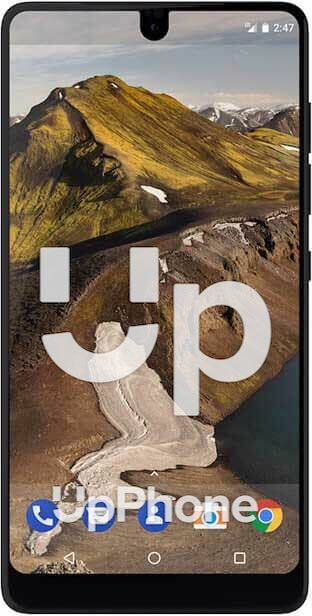 The Essential Phone has a 13 MP f/1.9 aperture main camera and is capable of recording 4K videos @ 30 fps. It has an 8 MP f/2.2 aperture secondary camera. The Samsung S8, on the other hand, has the 12 MP f/1.7 rear camera and an 8 MP secondary camera. This device has a huge internal storage capacity of 128 GB but does not support expandable storage. The S8 has a 64 GB internal space and is expandable up to 512 GB via microSD. The Essential Phone has a single downward firing speaker located at the bottom. Performance wise, it is not as good and as loud as other phones in its category. The Galaxy S8 also has a single bottom firing speaker. This device is equipped with a rear-mounted fingerprint reader which is pretty fast. The Samsung Galaxy S8, on the other hand, has the fingerprint reader, iris scanner, and a face scanner. This phone runs on Qualcomm MSM8998 Snapdragon 835 with eight cores and performs really well with very minimal lag even during heavy use. While the Samsung S8 has the Exynos 8895 Octa - EMEA (US) and Qualcomm MSM8998 Snapdragon 835 (China) and is also very snappy and powerful. The Essential Phone has a slightly smaller, considering its size, 3040 mAh battery which will barely last a day after moderate use. It supports fast charging, though. While the S8 has an even slightly smaller 3,000 mAh battery and has quick charge and wireless charging. The Essential Phone is a modular device where you can attach a couple of accessories for expanded functionality like the 360-degree camera. This device is founded by one of the creators of the Android OS. It has a very beautiful almost bezel-less screen display. This phone is also known as the Essential PH-1. The unit has no names, logos or any distinguishing feature written on it because simplicity is one of the concepts behind the product. This device has a very huge internal storage space.